Supergirl has been adding a variety of superpowered villains for Kara Zor-El to battle in her first couple of episodes, from the electrifying Livewire to the android Red Tornado to fellow Krytponian Non. Now the show has added an adversary that may not have any superpowers, but he’ll still be a formidable opponent. Heading to Supergirl later this season is the classic Superman villain Toyman, and he’ll be played by Revenge star Henry Czerny. Czerny is set to guest star as Winslow Schott Sr for at least one episode. He is described by Comicbook.com as someone who “weaponizes toys to wreak destruction and revenge.” As previously reported, Czerny’s Toyman will have escaped from prison and is determined to seek revenge against the man who cost him his job. Before that, however, he’ll attempt to reunite with his son Winn, who is Kara’s CatCo coworker and close friend. When Winn was first announced as one of Supergirl’s main characters, there was speculation that he might become Toyman, but for now it appears that title will solely belong to his father… though that doesn’t rule out the villainous legacy later being passed on. The Schott version of Toyman first appeared in the comics in 1943, making him one of the first members of Superman’s rogues gallery. He is a mechanical genius that transforms toys into dangerous weapons to use while committing crimes from exploding teddy bears to water pistols that shoot acid. Although Schott frequently fought the Man of Steel during the Golden and Silver Ages of comics, he hasn’t appeared as much in the modern era. However, he did sink to a new low when he killed Cat Grant’s son Adam (although he later said a robot look-a-like was responsible for the act), which has me worried that something similar might happen on the TV series. He also appeared during Sterling Gates’ run on the ongoing Supergirl series several years back, so it makes sense why the show would include him for the Girl of Steel’s live action adventures. 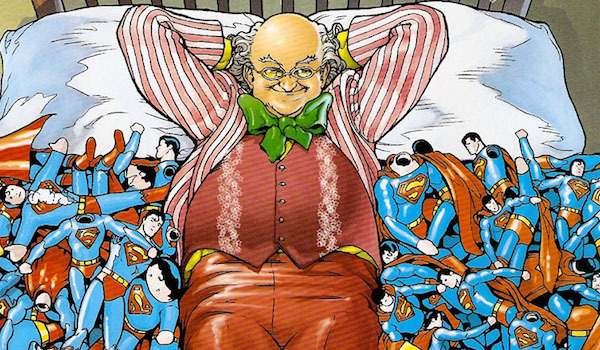 Outside of the comics, Toyman has appeared in shows like Superman: The Animated Series, Justice League Unlimited, Lois & Clark: The New Adventures of Superman and Smallville. In addition to playing Conrad Grayson on the ABC series Revenge, Czerny’s body of work includes appearances in Mission Impossible (the movie), The Exorcism of Emily Rose, The Tudors and Falling Skies. Supergirl premieres tonight at 8:30 p.m. EST on CBS (following The Big Bang Theory), and next week it will move into its normal 8 p.m. timeslot.